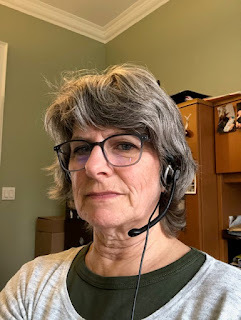 This blog serves to give you a glimpse into my creative ventures and what inspires them. Much of my art is directed by my faith and the awe I feel observing the natural world. The last few weeks, I have had the itch to paint again so I went through my photos from last year's kayak trip. It is always so hard to choose what to paint from all those beautiful photos. I usually look for some drama which most often comes from the skies in July because there is no snow or the colours of autumn at that time of year. On our first evening at our camp site, after dinner, a few of us paddled up the bay to explore. As we paddled the sun was setting and the sky filled with dark clouds that were edged with pink and purple. The rocks became grayer in the waning light and the sky was reflected here and there in the water of the bay. I decided to make this painting about the sky and so I cropped out a large section of the foreground water and took some other liberties with the design. As I learned last year in my acrylic painting course, I started with a black canvas instead of white. I really liked the result doing it that way. Every time I start painting it seems I have to learn all over again. The paint just doesn't go on smoothly and the first brush strokes are not at all beautiful. I always have to tell myself that it will come as I layer paint on. Starting to blend the sky. As I type out this blog, I am noticing that those clouds have to be much darker to move them in front of the light blue sky behind and above them and the yellow above the tree line needs to be more subdued. Having said that, I will make some artistic decisions that will enhance the painting. I do not want to copy the photo totally. 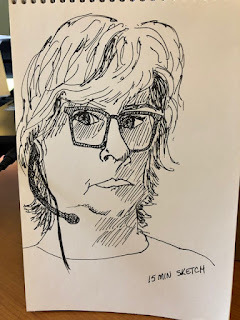 I recently enrolled in a Sketchbook Skool course called People Drawing People that starts next week. It's an online course and I'm really looking forward to it since I'm really bad at drawing people. 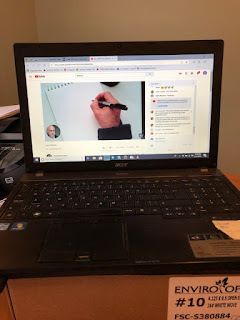 Today, one of the founders of Sketchbook Skool, Danny Gregory, did a live you tube instruction to prepare us a little for that course. We drew our selfies along with him and people all over the world who tuned in. So cool. It took me a while to find the live feed on my computer so I only had about 15 minutes to get my sketch done. I'm not making excuses since I don't think more time would have improved it. I brought a mirror from one of our bathrooms and set it up on a desk easel next to my laptop and sketched myself while I watched Danny Gregory sketching himself. Neither the photo nor the sketch are very flattering so I managed that part of the likeness well. I have always used several perpetual calendars to remind me of birthdays and anniversaries. I always thought they were a Dutch thing but I'm noticing them in our Canadian stores as well. I made one several years ago with images of my fabric cards on it. It has become somewhat out dated since many friends and relatives have died since. I have been wanting to make another and I've finally come up with a plan. Since writing out that plan, a few things have changed which often happens in creative ventures. You get into the creative part and the plan you made just doesn't work in reality. I had planned to make this calendar 4.25 inches by 11 inches. The reason for this was that if I want to print it this size would cost less since I could get two pages out of one 8.5 X 11 inch sheet of paper. Well, I've had to rethink that size since I've decided to make the pages out of fabric and stitch the designs on them. I've decided to use the full 8.5 X 11 size. I would also like to stitch a bible verse on each page and when I began with January's page it was evident that the size was too small to be able to stitch the bible verse on it as well as the date numbers such that they were legible. I am keeping a planning journal for this project to keep my ideas in one place. I have some themes for each month but the whole project is not yet fleshed out. For January, I'm stitching fireworks on a black background. All the stitching on this page will be white and silver. Below is the beginning. The body will be covered with dates and lines for writing names next to. On the bottom I've already stitched where the text is found and I will add the words of the text as well. For February, I chose the above fabric to represent ice and I hope to stitch snow flakes on this page. This was hand painted by myself but since I've cut this fabric for the smaller page there isn't enough left for the new larger page so I'll have to paint another piece. Below are my notes for the project. If there are any suggestions for themes for future months please help me out by sending them to me. When we moved into this house the kitchen cupboards had a dark turquoise paint on the center panels which I lived with for a couple of years but then had someone come in and paint them a neutral colour. 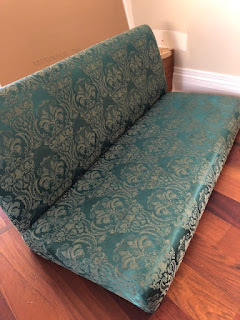 In the living room there was also a built-in bench covered in that same coloured fabric and I have been dreaming of reupholstering it for years. I finally went out and bought some fabric and this week I have been tackling that project. The first thing I had to figure out was how to take it apart. Having done that, I proceeded to remove all the staples that held the fabric on. Big job! It's not exactly art, but there is some measure of skill involved in doing this type of thing. 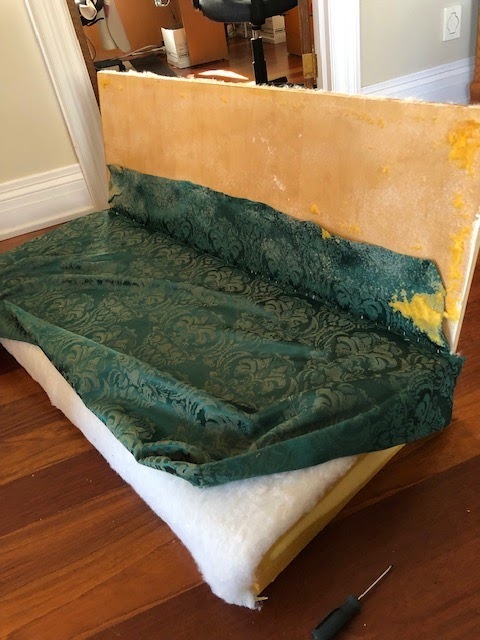 I found that they had glued the foam to the bench back which I had to try to loosen because the fabric had been put on before the foam. I was fortunate that I could reuse the foam since it was still in good condition. There is something very satisfying in recovering old furniture. Voila! New bench that fits better with my decor. Another of my goals for this year was to experiment with painting and dyeing fabric. I have been doing that for the last couple of weeks. 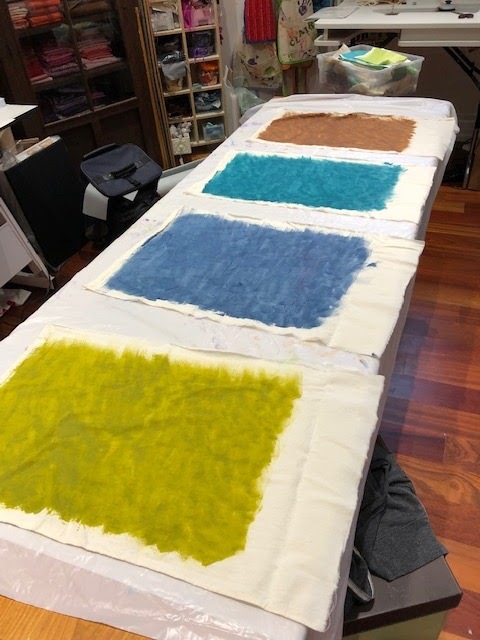 I still have lots of stuff I want to try to get the type of fabric I like to use in my art quilts but here are the results of my first experiments. First of all I worked with an environmentally friendly paint system that leaves the fabric pliable instead of stiff as some acrylic paints will do. 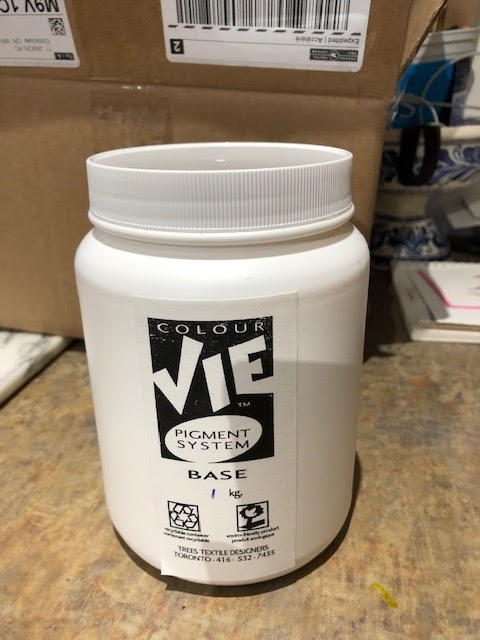 The system is called Colour Vie and it uses a pasty base to which I add pure pigments to get various colours. Because I am mixing up my own paint colours, I have been keeping a journal of the colour recipes and a swatch of the resulting colour in case I want to replicate that colour. To this white yogurt consistent base I add colour pigments. These are the bottles of pigment. 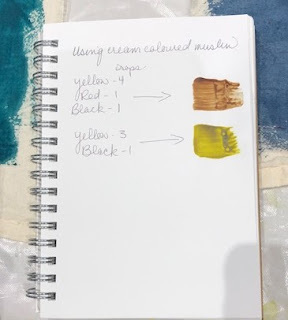 The resulting colours painted on a natural muslin. 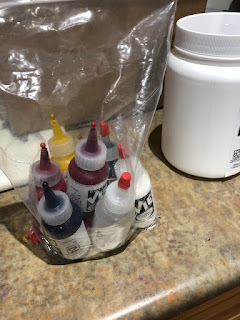 While the snow was still on the ground I wanted to try some snow dyeing which is done with powdered dye pigments. 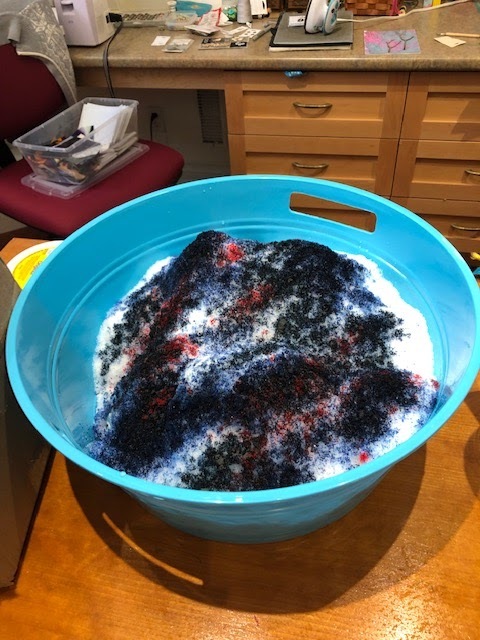 I lay my fabric on a rack in a tub, cover it with snow and sprinkle dye pigment on the snow. As the snow melts the pigment sinks into the fabric. I left it to sit overnight and then rinsed the fabric and washed it. Due to the amount of water from the snow, the colours are very pastel-looking. Some fabric I just scrunched together and others I folded and tied elastics around to see if I could get some patterning. I used this technique twice once with blue and red pigment and once with red and yellow pigment. 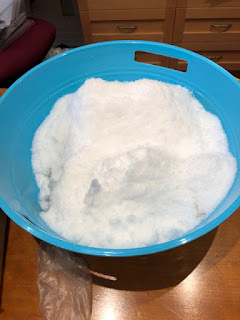 Snow covering the fabric in the tub. 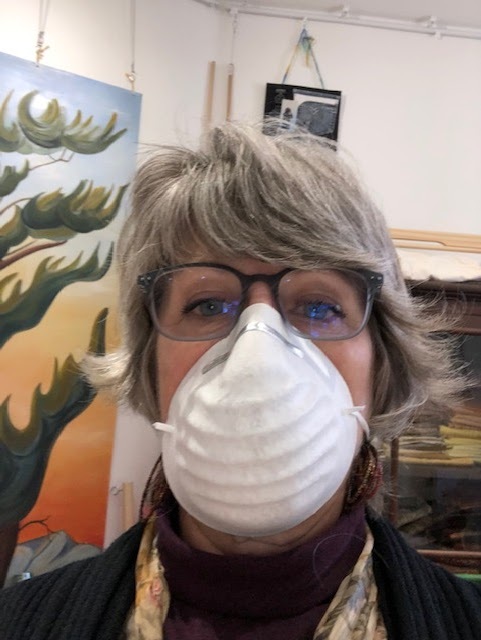 It's important to always where a mask when mixing or sprinkling dye as it's toxic to breath in. Snow covered with dye powder. Fabric after the snow has melted away. 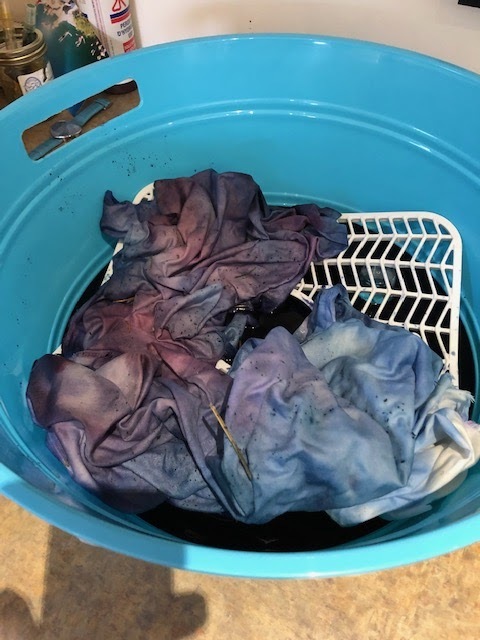 Next I mixed dye pigment with water and just squirted it over fabric that I scrunched and folded and tied elastics around. Here I used blue and yellow dye. The colour in these samples is darker and you can see the patterns left by the folding and elastics. 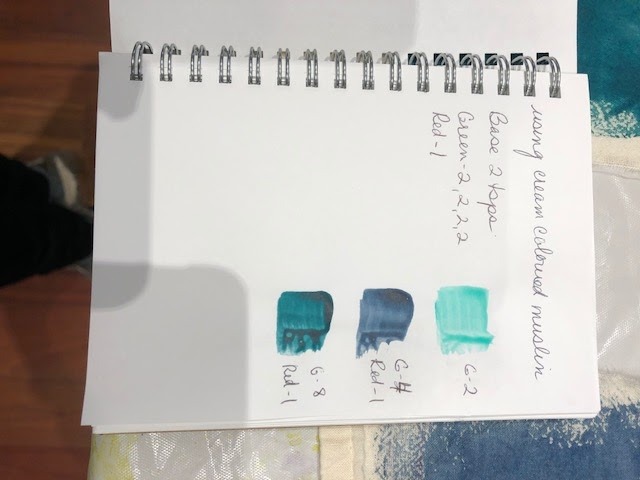 I will definitely use these fabrics in my art, however, the jury is still out on whether I will rely only on my own hand dyed or painted fabric for my art. 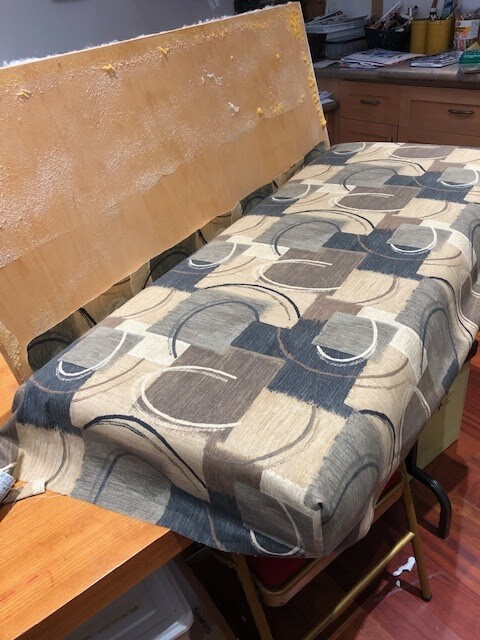 I still really like commercial fabric designs and they have been working well in my art quilts. As promised, below are the title pages for the last 7 years of our business scrapbook. 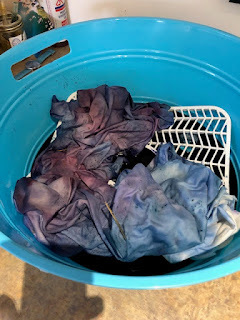 I've been experimenting with dying and painting fabric lately so tune in next Thursday when I'll be blogging about that. In 2014, I sketched throughout the whole season and put together a digital book. Scrap booking used to be all the rage years ago and perhaps it still is but I think with the invention of the digital book, scrap booking is becoming less popular. I have made several digital books but I like the look of scrap books that have a personal flavour to them. I have made small scrap books of some of my travels and they are great to look through. Of course, I also add my own sketches to them and glue in photos, receipts, post cards, ticket stubs and the like. I have kept scrap books of our family business since it began over 40 years ago. It is great to look back at our beginnings and see how we've evolved and grown. I've always added my own sketches to these books too and when I look back I also see how my art knowledge and skill has grown. I thought you might like to see some of those sketches. Below, are the titles pages for each year from 2007 to 2012 since we moved our company to our present location. Next week I'll post the last 7 years. I love sunflowers as a subject and yet I have so much trouble growing them. Too many squirrels in our neighbourhood. Watercolour peonies, another of my favourite flowers. This is a collage of flowers cut from magazines and one of my failed paintings ripped up. You'll see these iconic "domes" in many of the pages. "Domes" seen from a different angle. I'm an artist who uses variety of media to capture my love of nature and the outdoors. 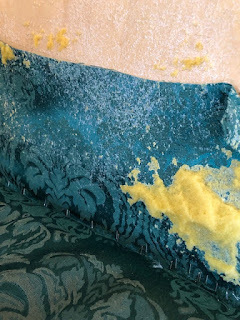 The subject of my work usually determines whether I will use watercolour, acrylic, graphite or fabric as my medium. All images found on this site are the property of Arja Speelman and may not be used without permission. All images on this site are the property of Arja Speelman and may not be used without permission. Powered by Blogger.